I’ve always said, “it’s not the money, it’s the glamour.” The table to the right illustrates just how glamorous being an independent musician can be. As of October 7th, 2004, these figures are very close. You’ll notice I haven’t yet calculated my phone bill — I make radio tracking calls to about 50 stations across the country, some of which I’ve called 6-8 times and have yet to confirm whether they intend to add the record to their playlist or not. In addition, when a station adds a new release they often request more copies to give to their DJs and as giveaways for listeners. So the cost of those promotional copies (plus postage) will also increase until the end of my campaign, which I began the first week of September. Keep this in mind: I’m one of the lucky ones. 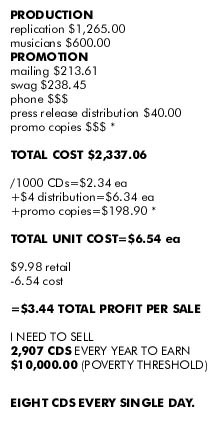 Update 12/10/04: Current mailing and promo copies brings total cost to $2,725.88. Update 5/20/06: Now I have a wife — I’m selling for two!